14-19. It is as a man travelling into a far country, who called his own servants, and handed over to them his goods. And unto one he gave five talents, to another two, and to another one; to each one according to his own strength; and straightway took his journey. Then he that had received the five talents went and traded with the same, and made them another five talents. And likewise he that had received two, he also gained another two. But he that had received one went and dug in the earth, and hid his lord's money. After a long time the lord of those servants cometh, and reckoneth with them. Having said above, "You do not know the day when the Lord will come," He adds this parable as well, showing that He will come suddenly. For like a man about to travel into a far country, so too the Lord has called His own servants and distributed His property among them, some to one, some to another. Christ, Who became man for our sake, is the man travelling into a far country, in reference either to His ascent into the heavens or to the length of time that He is long-suffering and does not summarily demand works from us, but waits. His servants are those who have been entrusted with the ministry of the Word, such as bishops, priests, and deacons, and who have received spiritual gifts, some greater, some lesser, each one according to his own strength, that is, according to the measure of his faith and purity. For into the vessel which I will offer to God, He places His gift to me. If it is a small vessel, a small gift; if it is a large vessel, a large gift. Immediately he who had received the five talents went and traded with them. See the speed with which he acts, not in the least bit negligent, but immediately trading and doubling what he had received. Whether a man be gifted with speech, wealth, the authority of kingship, or any other power or skill, if he desires to benefit not only himself but others as well, he doubles what has been given to him. But he who buries the talent is he who cares only for his own benefit and not for that of others, and he is condemned. But if you should see an intelligent and skilled man misusing his intelligence in various pursuits, in deceitfulness, and in earthly affairs, you may say that such a man has buried his talent in the earth, that is, in earthly matters. But after a long time he who bestowed the silver talent returns. The silver talent may be in the form of a silver tongue, the gift of eloquence, for the eloquence of God is as silver that is tried by fire. Or, the silver talent may be any gift that makes one brilliant and glorious. He comes and demands a reckoning from those who received. 20-30. And so he that had received five talents came and brought another five talents, saying, "Lord, thou deliveredst unto me five talents: behold, I have gained besides them five talents more." His lord said unto him, "Well done, thou good and faithful servant: thou hast been faithful over a few things, I will make thee ruler over many things: enter thou into the joy of thy Lord." He also that had received two talents came and said, "Lord, thou deliveredst unto me two talents: behold, I have gained two other talents beside them." His lord said unto him, "Well done, good and faithful servant; thou hast been faithful over a few things, I will make thee ruler over many things: enter thou into the joy of thy lord." Then he which had received the one talent came and said, "Lord, I knew that thou art a hard man, reaping where thou hast not sown, and gathering where thou hast not strewn; and I was afraid, and went and hid thy talent in the earth: lo, there thou hast that is thine." His lord answered and said unto him, "Thou wicked and slothful servant, thou knewest that I reap where I sowed not, and gather where I have not strewn: thou oughtest therefore to have put my money with the bankers, and then at my coming I should have received mine own with increase. Take therefore the talent from him, and give it unto him which hath ten talents. For unto every one that hath shall be given, and he shall have in abundance: but from him that hath not shall be taken away even that which he hath. And cast ye the unprofitable servant into outer darkness: there shall be weeping and gnashing of teeth." 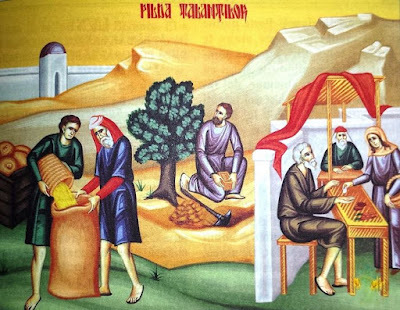 Both of those who had worked and traded with the talents given to them are praised equally by the master, each one hearing, "Well done, thou good and faithful servant." Good we understand here to mean "loving all mankind" and "without spite," he who imparts his own goodness to his neighbors. Those who have shown themselves to be faithful over a few things are made rulers over many things. But even if we are deemed worthy of gifts in this life, that is nothing in comparison to the good things that are to come. "The joy of the Lord is the unending gladness which God has, rejoicing in His works, as David says" (Ps. 103:31). With such a joy do the saints also rejoice in their works, just as the sinners grieve over their own deeds and regret them. The saints have the Lord as their wealth and they rejoice in Him. See that he who received the five talents and he who received two were deemed worthy of the same good things. Though a man may have received but a few things, if he is a good steward even of his small gift, he will enjoy the same honor as he who was deemed worthy of, and accomplished, great things. For each one, according to what he has received, is seen to be perfect to the degree that he accomplishes what he has been given to do. Such are the good servants; but the wicked and slothful servant justifies himself differently, in a manner befitting to him. For he calls his master "hard", as many today call their teachers "hard" or "exacting." It is indeed exacting to look for obedience from men, for God did not create obedience within man, nor did He sow in him an obedient disposition, [but instead God gave man free will]. This is what the unprofitable servant means when he says, "You reap where you have not sown," that is, You require an obedient disposition from all men, although You have implanted in no man an obedient disposition. When the servant says that the master is hard, he condemns himself. For the servant ought all the more to have been diligent knowing that his master was hard and severe. For if the master required this of others, so too would the master require this of him. "And you, O unprofitable servant, ought also to have multiplied what you had received and made disciples from whom I, the Master, could demand what is due." Christ calls disciples bankers, for both exactly account for what has been delivered to them. What is the increase which He requires of the disciples? The showing of works transacted. For the disciple who receives the word from the teacher, must keep the word and give it back in its entirety; but the disciple also adds to it the interest, which is the doing of good. So God takes the gift away from that wicked and slothful servant. He who has received a gift by which to benefit others, and does not so use it, forfeits the gift itself. Do you see that he who applies the greater diligence draws to himself the greater gift? To him who has the greater diligence, more grace will be given and in abundance. But from him who is not diligent, even the gift which he thinks he has will be taken away. For he who is not diligent and does not work and trade with what he has received, does not have the gift, but only appears to have it. He has blotted it out by his neglect.